LunaTik (LunaTik haha, get it?) is a case (damn it, another case!) that turns one of the new tiny iPod nanos into a watch. Of course this would look ridiculous on my slim yet strong and manly wrist. It’s a really interesting oxymoron: Wearing it makes other kids want to beat you up during recess; yet the only people large enough to wear it are the ones that nobody dares try to beat up. 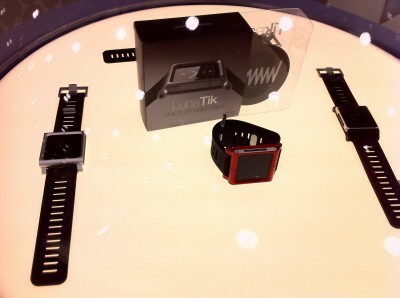 LunaTik case lets you wear your iPod nano as a watch. TV Hat, on the other hand, will for sure get you beat up in recess. Inside that freakishly large hat you place an iPhone. There is a special lens so you can focus at such a short distance and enjoy all your adult entertainment with privacy. I didn’t make that up: the brochure specifically pitches it as a way to enjoy adult content on planes and so forth. I’m truly terrified to report that the thing is inexpensive, comfortable, and works quite well. I can see my TV-addicted dad or my iPhone-addicted niece loving one of this – while watching only appropriate material, of course. 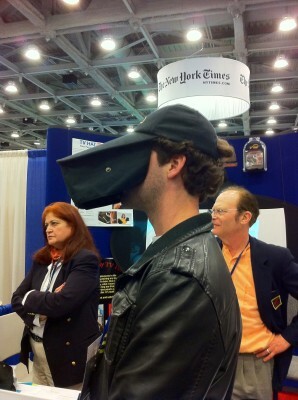 Watching some appropriate video using an iPhone inside a TV Hat. That’s enough for part 2. Stay tuned for Macworld report part 3! Previous PostMacworld report part 1Next PostEngland? Great Britain? United Kingdom?